Mushroom Pea Risotto is decadence in a bowl! Perfect to serve as a side to baked chicken or fish. Great dinner for meatless Monday. 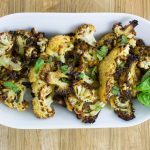 Weight Watchers friendly recipe- 6 SmartPoints! Sometimes I just want a big bowl of rice. 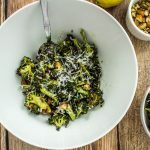 Such a simple food that can be cooked with so many different ingredients and dressed up in a ton of unique ways. Most of the time when I make rice, it’s served with curry or in a casserole. When I want rice to be the star of the show, I make risotto. Have you ever had risotto? It is seriously delicious! Fluffy, decadent, and usually with a little cheesy. My Mushroom Pea Risotto is pure bliss. 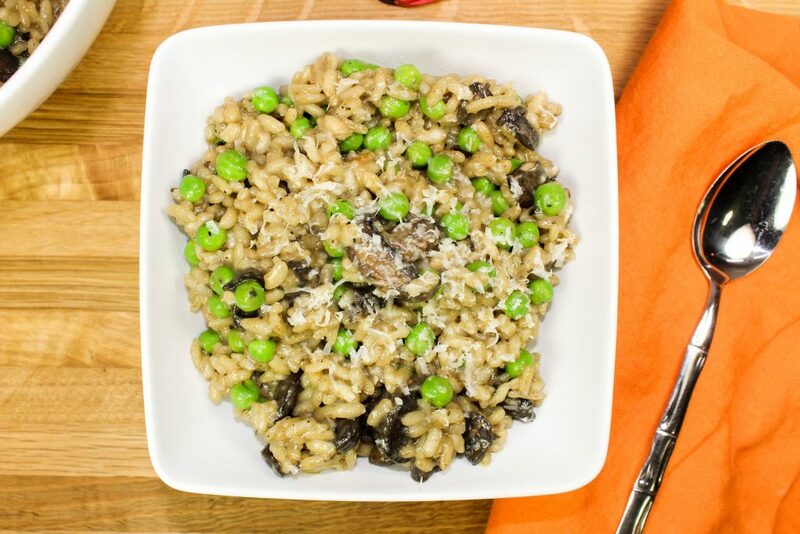 Delicious puffy rice, sautéed mushrooms, crisp peas with parmesan cheese and a hint of lemon are decadence in a bowl. This dish is perfect to serve as a side to baked chicken or would be a great dinner for meatless Monday. Surprisingly low fat! This is a Weight Watchers friendly recipe and each serving is 6 SmartPoints. Risotto is always something on the menu at an Italian restaurant. Years ago I would always order it, devour it, and think that there’s no way I could make it at home. Well, the first time I made risotto a few years ago I could not believe how easy it was! Seriously… risotto sounds super fancy and hard to make at home, but it really isn’t. I’m not a trained chef, so if I can make it YOU CAN! Risotto just takes a little bit of time to make, about 30 minutes, and constant attention. 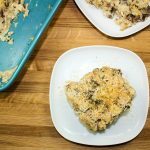 What I love about risotto is that you can make so many unique and delicious variations of risotto. Just add in whatever vegetables you like, and it’s a hearty meal in a bowl! The key to making risotto at home is making sure you pay attention and constantly stir. To start, sauté garlic and a shallot in a cast iron skillet for a few minutes in olive oil. Add the Arborio rice and cook the rice for about 3 minutes or so until the rice is translucent. In a large saucepan, heat up vegetable broth on low heat. 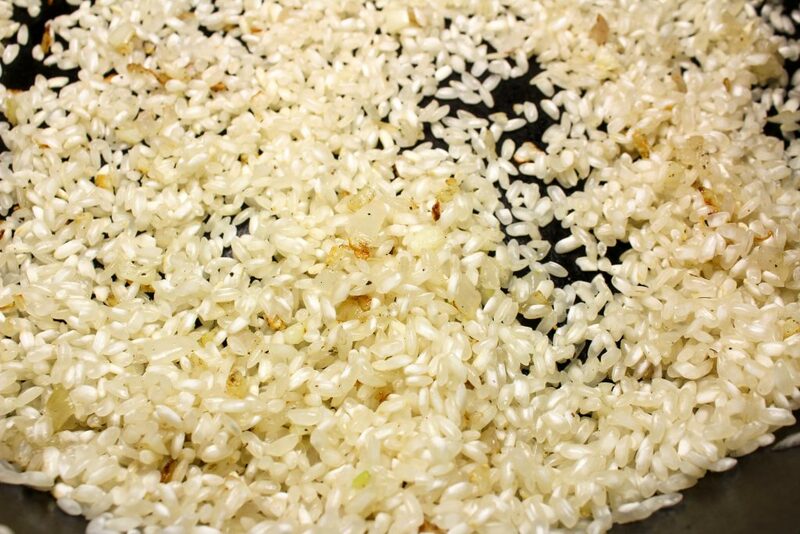 After the rice has been cooked for 3 minutes, ladle in one cup of vegetable broth and stir the liquid into the rice until the liquid is almost completely absorbed into the rice. Continue to ladle in one cup of broth, mix into the rice, and stir until the liquid is almost completely absorbed. You will basically repeat that step until there is no more vegetable broth left. All in all, this takes about 30 minutes or so. Mushroom Pea Risotto decadence in a bowl! 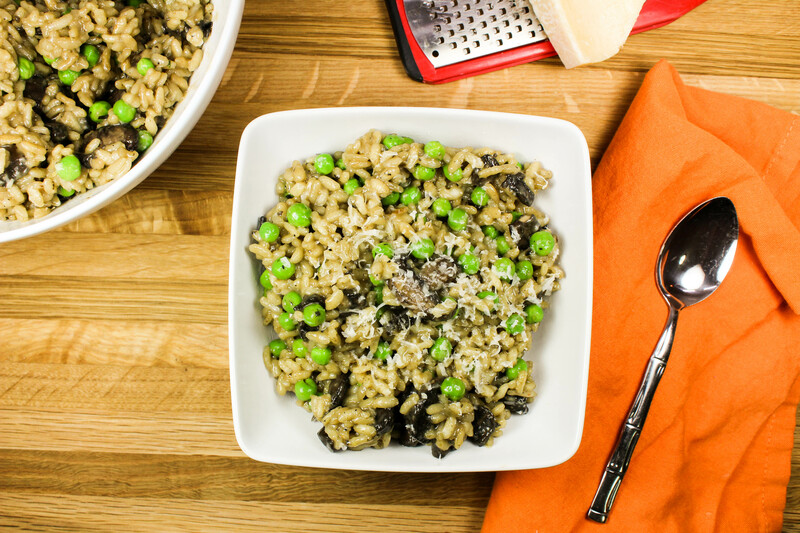 Delicious puffy rice, sautéed mushrooms, crisp peas with parmesan cheese and a hint of lemon are decadence in a bowl. This dish would be a great dinner for meatless Monday. Fancy food made easily at home! Not only do I get really excited to eat this dish at home, but so does my husband! This dish would be great served with seared scallops or baked chicken. It’s also a one pot meal! Heat vegetable broth in pot over low heat. Dice garlic and shallot and set aside. In cast iron skillet over medium heat, add oil, garlic, and shallot and sauté for 2 minutes. Add rice and mix rice well so it is coated with oil. Cook for about 3 minutes until rice is translucent. Ladle one cup of vegetable broth and stir until all liquid is just about absorbed. Repeat this step until there is 1 cup of liquid left. Add mushrooms and final cupof liquid. Turn off heat and mix until liquid is absorbed. Add frozen peas, lemon juice, and lemon zest. December 2, 2016 at 5:30 pm The lemon really adds a nice freshness! Thanks Ayanna! December 2, 2016 at 6:29 pm Awesome Ive been looking for a reciepe to cook risoto?? 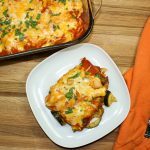 December 5, 2016 at 10:09 am I'm glad you found this recipe! Thanks so much for commenting Loudy! December 5, 2016 at 10:08 am Me too Karen! Thanks for commenting! December 3, 2016 at 3:22 am It looks so yummy and I can't wait to follow this recipe to make one like this! I always cook at home and this is one of my passion, thanks for sharing it!! December 5, 2016 at 10:08 am Great Davide! I hope you try this one soon! !